Waveform Verification Set Model: 06-00059B - NOISE LABORATORY CO.,LTD. 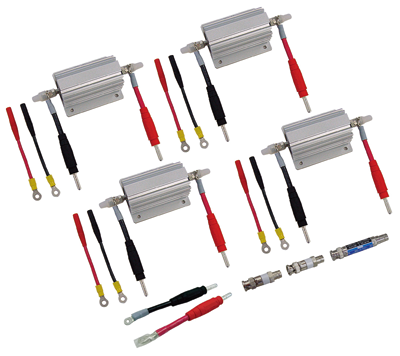 A set of resistors and attenuators required for measuring Test Pulse1/Test Pulse 2a/Test pulse 2b/Test Pulse 3a/Test Pulse 3b/Test Pulse 5a from ISS-7610, BP4610, ISS-7630 and ISS-7650. Resistor required for measuring Test Pulse 2b from BP4610. Resistor required for measuring Test Pulse 2a/Test Pulse 2b 24V/Test Pulse 5a from ISS-7610, BP4610, and ISS-7650. Resistor required for measuring Test Pulse 1 from ISS-7610.